We’re fortunate here in the UAE. We probably live in the safest country in the world, where home break-ins are practically unheard of in Dubai, Abu Dhabi, and the rest of the emirates. So why would you want a panic room then? There’s no crime, and other than the occasional sandstorm, the weather’s pretty stable (you know – hot, and less hot). For starters, if you truly want your home to be your castle, it needs to be built like a fortress. It gives you that peace of mind that you, your family (pets included) will be safe should the unexpected happen. But let’s not kid ourselves – building a panic room (also known as a ‘safe room’) is a serious investment, requiring time and money that you need to put into carpentry, painting, IT, and other necessities. So let’s get started. First, where should your panic room be? Of course, at a bare minimum, should be able to fit everyone that lives in your home comfortably as you may need to bunk out there for a few days. Rooms that may meet these minimums may include your walk-in closet, master bedroom with a bathroom (NOT on the ground floor though), basement, storage room, garage, and so forth. Just keep in mind that everyone in your home needs to get to that panic room, and get to it QUICKLY. Therefore, ease of access is definitely a factor you need to consider. The door separates you and from the danger behind it. So no flimsy, MDF door will work. Think of House of Cards – see when Underwood walks out of the Oval Office? Did you see the thickness of the doors? That’s what we are talking about: doors that can’t be broken down. So either get a carpenter to make you some super think durable doors, or lay some reinforced steel slabs on it. And there’s no point having an unbreakable door when you’ve got a weak lock. So add locks. More than one. Start with a heavy duty reinforced deadbolt system. Then work from there. Remember, your goal is that NO ONE, be he Hulk or human, can break down that door. Ideally, you should have no windows in your panic room. But if you do, it’s best to replace with them ballistic, bullet-proof glass. Make sure to have curtains too so no one can peer into the room and strategize their attack. Get ready to really spend those dirhams. This will be the most expensive part of your project. You do NOT want a bullet to go through your walls. Thankfully, most walls in Dubai and the UAE are made with concrete, which gives you some protection. Some. If you are on a smaller budget (but still have money to spare), get some heavy-set custom-made furniture built (like shelves and bookcases to reinforce the walls and the door. No point of having a panic room when you can’t contact the authorities. Make sure to install a land line (in case you lose reception in your panic room). If you have OK reception, bring your cell phone along with an extra charger. CC TV is not a bad idea either, especially ones that allow two-way conversations. This way, you can hear what’s going on and also warn the intruder that the police is on their way. You may be there for the long haul, so make sure to bring plenty of drinking water and canned food (and/or food that doesn’t require refrigeration). Bring plenty of entertainment (TV, board games, etc.) because of the burglars don’t get to you, boredom will. Don’t forget your hygiene kit (soap, toothpaste, and so forth) and a first aid kit just to be sure. And make sure to bring some extra clothes. 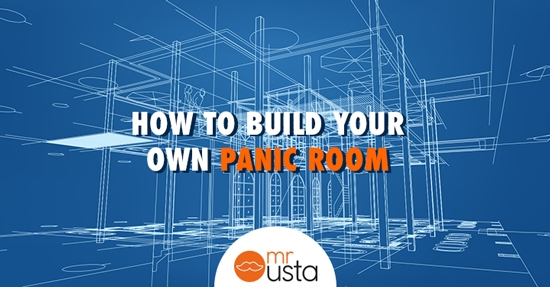 Building a panic room is no easy undertaking, and you’ll need outside help. However, your security and your family’s should take precedence over everything. And heck – if you aren’t going to use that room, it could serve to be a glorified safe for all your expensive valuables. See? With a panic room, it’s win-win for all (except the people to rob your home – they lose out).